My system for streaming is a mini computer...ubuntu ...celeron J1900...I have 1gb service from my isp . Running open vpn.....best speeds i can get are 40-60... as i'm a long way from any servers. I installed wireguard and get 120-160. So this confirms the celeron can't keep up. So I ordered a asus rt-ac86u 2900....should be here in a few days. My reading suggests the processor in this unit will process openvpn....so I can then remove vpn from celeron system. OPenwrt and dd-wrt don't have firmwares for this unit.....but there is a merlin version....which doesn't support wireguard. I did find some info where some people have ssh..into router and installed it....but as I've never tried or even saw this done before...potential for disaster is probably high. So my question is..if anyone knows how to to it...a step by step would greatly help. That being said....my immediate plan is to put openvpn on it....which looks very straight forward. There are many clever people there and also the man himself who updates the Merlin firmware, i am sure your question will be answered . I have the RT-AC86U and my UK BT fibre connection with vpn enabled gives me approx. 62-65 download, only 5% less than my IP speed on speedtest.net. So after a bit of trial and error....working like a dream. Went from speeds 40-60 open vpn to 160-170.
found info on policy rules to kill tun if it goes down. i'll continue with that for now until I find an easier way to try wireguard on it. Glad to hear that, what changes did you make? to clarify....only real changes I made was to move vpn from my mini computer (celeron J1900) running ubuntu to a router that could process openvpn. I did use wireguard on it for a couple weeks....speeds went from 40-60 to 150-170....which convinced me that celeron was bottleneck....so ordered router based on everything I read about it. My challenges with router were due to my own mistakes. Flashed it to Merlin software right away...no problem, My challenges were mainly once I got it working...I tried tweaking a few things. Problem with that is bell fibe home hub 3000 (tv, internet, and phone) is not overly receptive to changes. When I'd make a change in asus settings....homehub would not communicate with router. (no internet)...and i'd have to unplug whole system for 10-15 minutes. It's working fine now....but I can't go into homehub on anything connected to asus router....have to use ipad which is running on homehub wifi. On a different note....when I first signed on with torguard.....about a week later I noticed they were on real-debrid whitelist as cooperative...any server I connected to recognized ip as a torguard vpn and real-debrid worked. That is no longer case....when I tried wireguard....I had to contact them to accept my ip which took a day. 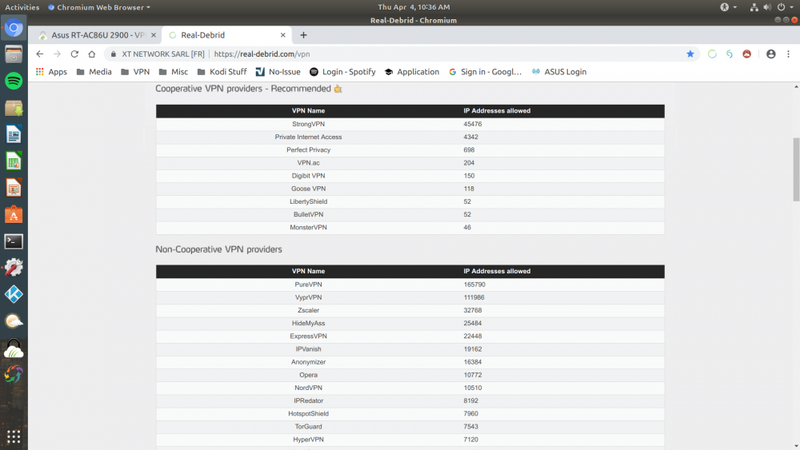 So I noticed with the past few days using router...connecting to new york server.....openvpn was working....however ips was not on real-debrid whitelist....I'd have to turn off openvpn in router....turn it on and repeat process until it gave me an ip that worked. Not a deal breaker for me...but it would be beneficial to your customers if you updated your ip lists with them....as it may be a deciding factor for some customers. I also realize you have over 7500 ips listed with them...just a suggestion. We have now submitted a new IP list to real debrid, I suspect they will add them to the whitelist at some point tomorrow. got to say.....i'm real surprised at how much faster my pings and speeds are after switching vpn over to my router.